Navigate: StoreFront / Track Car Safety Equipment / Harnesses / TRS Harness "New Pro"
One of our best sellers; the TRS New Pro is a very high quality harness at an affordable price. Compare to others: TRS offers superior options, lighter weight, and made in UK quality that many of the other brands can't touch- and at a far better price that the typical 'heavily marketed' brands you will find sold by many of our competitors. The New Pro is designed with 3" shoulder straps and 2" inch lap belts. Many drivers find this setup a revelation when it comes to comfort as the lap belt is capable of resting across the mid section with less pressure point and "digging in" sensation. Each variation of the New Pro is available with standard high strength adjusters, or with their superlight option making them far less fatiguing and easier ingress each time you strap in. The Ultralight option features this high strength-light low-weight alloy used throughout on all belt adjusters. A top quality harness using 75mm shoulder straps and 50mm lap straps. 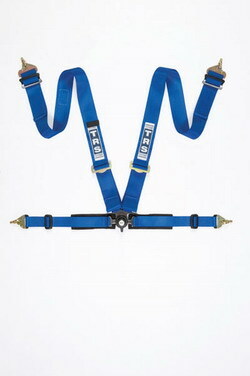 A top quality harness using 75mm shoulder straps with alloy adjusters and 50mm lap straps. Available as 4, 5 or 6 point to fit all standard saloon cars, comes complete with eye bolts and in 9 colors. FIA homologated. The Top of the Line harness using 75mm shoulder straps with alloy adjusters and 50mm lap straps with alloy adjusters. We try and stock the colors Black, Blue, and in some models Red. The colors Green, Grey, Yellow, Orange, Pink, and Violet are available through special order. The New Pro is not HANS compatible; please see the TRS Magnum or one of our TeamTech Harnesses if you’re using a HANS device. Please feel free to call for additional colors or questions.